It is during these months that these sea creatures come into the warmer shallow Florida Gulf Coast waters to mate. They also are lazy and bury themselves in the bottom sand to stay away from being eaten by sharks or other larger rays. What makes things tough, however, is that many hotels, resorts, and rental condos do not make this little piece of information well known to their vacationing guests. 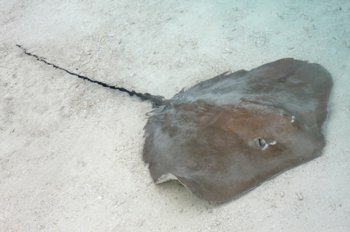 A stingray injury is usually termed an "isolated incident" by management. There are a couple of things you can do, however, to dramatically minimize your chances of getting nailed by the extremely painful sting of one of these sea animals. First, get rid of the idea that Florida stingray season coincides with baseball season. It doesn't. Sea animals don't read the calendar. Just like humans, some are self-starters and get to places early...and some are pokey and stick around late like desperate party guests. Second, when you are entering the water...be vigilant. In the past week, the three sting victims I saw just waded carelessly or sloshed mindlessly into the water, and were painfully stung about 10 feet from shore. Those stingray injuries could have easily been avoided with just some basic understanding of these animals. Stingrays seem to like the area between 3 to 10 yards off the beach, especially where the small "drop off" is just as you enter the surf. This is a real problem because this area is where most people and kids play around. Ben Ibba is local firefighter. He told me this story. "I've been stung twice, and bot times it was because I was not staying present and paying attention. Plus, both times were right by the lip of the drop-off. I grew up around here, so I know better. For some reason, I was clueless both times and ended up getting barbed real bad. The first time, we had relatives down here from Michigan. It was their first time. They were hesitant about going into the Gulf because they were afraid they'd get bitten by a shark. I told them that would not happen. I was acting like the 'Alpha-Male', telling them there was nothing in here that could hurt you. Two seconds later, I felt the side of my foot bump into a ray. That thing lashed me right across the ankle. Man did that hurt. I tried to play off the sting from the toxin, but I was suffering. I leaned on my brother-in-law and hopped up to one of the hotels. They knew what to do. They had a special bucket they filled with soapy hot water. I soaked my foot in there for 45 minutes. It felt a lot better after that. My in-laws said they were not coming back to visit un in the summer, anymore. The second incident happened when I was trying to get my wife to come in the Gulf with me. She said she would only if I carried her because she did not want to get eaten by a shark, or step on a stingray. I told her the possibilities of either of those happening was about a million-to-one. I had just walked in the water, and was right by the edge of the drop-off. While she was walking toward me, I dropped down on my knees to splash some water on my face. Wouldn't you know it? I kneeled right on top of a ray. That thing barbed me right in the knee. Man, that hurt like crazy. One of the people near us went up to a hotel and brought back a bucket with hot water and a rag. That took a long time, but it brought some relief. My wife said she was never even going to think about going in the Gulf again, even if it is not stingray season...and that we should move to Ohio." Activity and energy frighten these shy sea creatures. They can't see well and rely on electro-sensors/vibrations to let them know they are in danger. It is not uncommon for people to see them scooting away as they enter the water. Problems start when their little pea-brains figure they outran a predator...and they settle in right behind the person who just scared them. People step backward and...BAM. Try not to walk or bounce around backwards when you are out in the ocean. Finally, from the moment your feet hit water...start shuffling. 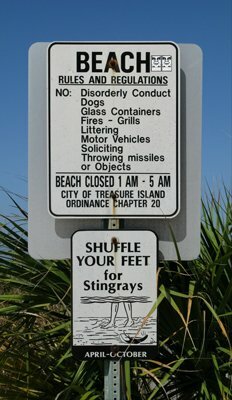 Don't mindlessly slosh around...don't sprint into the surf like a triathlete or a bikini model...shuffle. The Stingray Shuffle. This sends vibrations through the sandy bottom and scares rays. They are not predators who attack. Their painful sting is purely defensive. They react just like a desert scorpion. 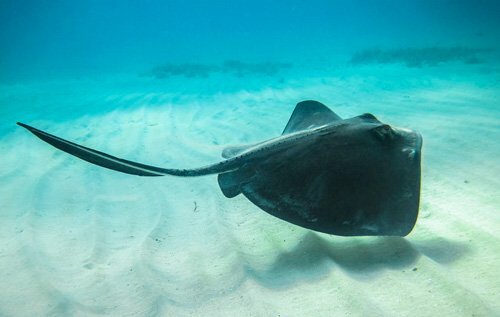 Note: By adhering to the above tips, even using the Stingray Shuffle, does NOT guarantee you won't get barbed, but it will tremendously reduce your chances of a stingray injury. I am out in the Gulf of Mexico almost everyday at Treasure Island Beach and I have never been stung. I'll be the first to admit I've been lucky because I have stepped on rays many times when I've let my mind wander. Don't let your visit to a beautiful Florida beach be ruined either by not knowing about these sea animals or from fear of going into the water. A little stingray info can go a long way in prevention. A sting should always be taken seriously because people react differently to the toxic venom. To learn more about these ocean creatures at Florida beaches and what to do if stung, please click the link below. 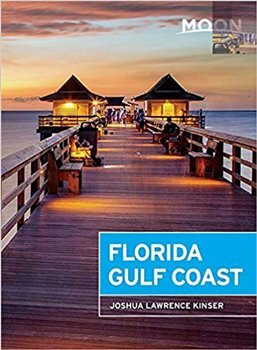 Learn more about Florida's beautiful Gulf Coast.